I’ll Be Right There, by Kung-Sook Shin. I’ll Be Right There, by Kung-Sook Shin. Other Press (2014), Paperback, 336 pages. A haunting book by an award-winning Korean woman about young people being available to each other and the painful guilt of having failed to be there when needed. The best summary of this excellent book is perhaps that of its author in an afterword for her novel. I’ll be Right There is a story of young people living in tragic times. It is also the story of people who find themselves separated, despite their love for each other, because they carry wounds too deep to overcome, and who struggle to come back together. Central to the novel are the memories of Yung Joon as she looks back on a time eight years earlier when she was attending college in Seoul. Alone and devastated by her mother’s death, she spent, her time exploring the city and visiting its historical palaces and shrines. Walking made me think more and focus on the world around me. Moving forward putting one foot in front of the other, reminded me of reading a book. I came across wooded paths and narrow market alleys where people who were strangers to me shared conversations, asked one another for help, and called out to each other. She meets a young man and woman who had grown up together. The three of them become fast friends despite the emotional burdens each carries. We fixated on silly, pointless things sometime to fight off our anxiety and loneliness. A professor inspires them with his stories and a childhood friend of Yoon’s joins them before his army service begins. All of the characters carry their own scars from the past, but for a time they find joy in each other’s company. Yoon and Myungsuh form bond as a couple, but pain and uncertainty continue to intrude on their lives. Kung-Sook Shin is a very talented writer who continues to live and write in Korea. She has published seventeen novels in Korean and has a reputation as a leading author there. Two years ago, her novel Please Look After Mom, was published in English and was awarded literary prizes. (See my review.) 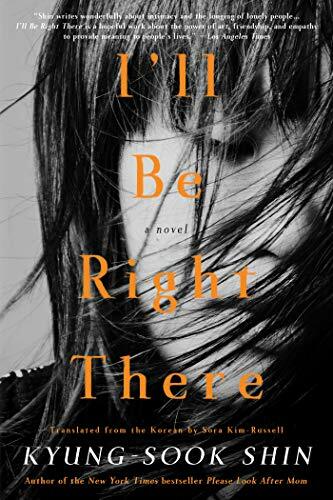 I’ll Be Right There was written in Korean and translated into English by Sora Kim-Russell. I highly recommend this novel to readers looking for something beyond a typical “coming of age” story or romance. A book about holding on to joy in the face or pain and reaching out to others. ← Pleasantville, by Attica Locke. Hmmmm. I strongly disliked Please Look After Mom (and we almost always coincide on books! ), so I’m not sure if I’d get along with this one or not. I should probably give her a second chance though. Yes, we usually agree. I am surprised when we don’t. but if you disliked Mom, I doubt you’d like her new one. Something about the mood is similar, but I can’t articulate just what.